Can’t ask for better weather to do a 50 mile ride! Friday night it dipped down into the 40’s and Saturday the temperature was upper 70’s. Hard to imagine that it is AUGUST!!!! For those of you in my life on a regular basis, you will understand my joy at competing at this ride. I was injured in 2010 and have not been able to ride regular or consistently since that time. I still have off days, but I bought stock in the Aleve company so now I have plenty of drugs to keep me numb. This ride is a milestone for me – AND for Miss Daizy – I have not been able to ride 50 miles for four years and Miss Daizy has no idea what’s about to happen to her. This year is my first 50 mile endurance ride since 2010. I tried one in 2011 but had to pull myself because the pain was too bad. I tried another one in 2012 but had to pull myself because I made my horse lame from riding off to the left all crooked like some drunken monkey. I rode two CTR’s in 2013 and then I was out the rest of the year because my back went completely out of whack again. Okay. Big Loop Boogie is a brand new ride this year for AERC. Since I am working on my ECTRA versatility and need a 50 mile ride as part of that goal, and I like to support new rides, and it was listed as a “MODERATE” ride, I entered. I tricked Dom into riding Steel so I could bring both girls to the ride. Faith was a wonderful ride manager and hostess and the ride was a huge success, she filled all the entry spots long before the cut off date. The ride is in northwestern Pennsylvania, in the big hills. Being from West Virginia, those big hills make me homesick (and happy at the same time). Even though the ride was five hours from me, I totally and thoroughly enjoyed the scenery and the views driving out there. Except I have to say that about 50% of my travel included Pennsylvania construction. You know, the kind where highway traffic is one lane for miles and miles and miles but there isn’t a single construction vehicle to be seen. Yep, that kind. My friend Cindy was meeting me at the ride. We were going to camp together, share stories and ride together the next day. 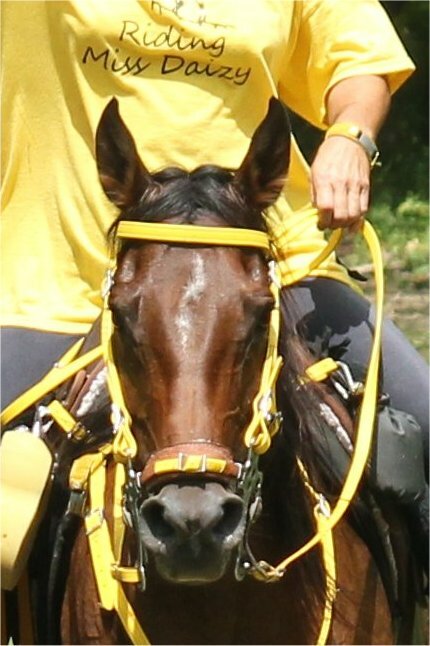 Her gelding Bailey and Miss Daizy work about the same speed – FAST – and all four of us get along marvelously. I was looking forward to great conversation and happy riding with her and Dom. I arrived without any “driving to the ride” adventures. Sorry, that was pretty boring, but it was good for Miss Daizy and Steel who had to be cooped up in the trailer for five hours. It was also good because I had no cell service from about the time i hit Rt 15 until I got to the ride camp. I tried several times to send Marc a text message on my way there and while in camp but it was no use. Sprint did not have any (brain) cells up this way. Cindy had a perfect spot at base camp (which is snuggled in between mountains and was peaceful and quiet (until later that evening when the coyotes started singing). I set up camp, having learned my lesson at Muckleratz, and made two pens. One for Steel and one for Miss Daizy. Not more sharing pens. Miss Daizy chased Steel all night long at Muckleratz. Cindy was very kind to me and helped me set up the panels so I had them ready to go in about 15 minutes. THANKS CINDY!!!! A little side note here. At the last ride, Steel was 18 and Miss Daizy was 57. Their numbers are still faintly showing on their butts. At THIS ride, Steel is 518 (how convenient) and Miss Daizy is 517. It was very easy to renumber them this ride. I quickly had them vetted in and everything was ready. Now I had time to go around visiting people. I was surprised when I saw how much space we had for parking that Faith cut off the entries at 60. She had enough space to bring in 20 more rigs! Which, in theory, could have been 40 more entries. FAITH! Are you reading this??? You did most excellent managing the ride, have more entries next year! My friend Paula gave me cantaloupes fresh picked from the garden to share at the dinner. (I kept one for myself – HA!) Unfortunately, there was no large knife to cut them until one nice guy in line pulled out a bowie knife from his belt knife sheath and cut them up. Everyone that got a piece said they were remarkably sweet. During the dinner, the temps went from 64 to 44 … yep, soon as that sun started to set behind the mountain, it got quite chilly. Like BRRR chilly. People didn’t hang around for too long after the ride briefing because they were too cold. Not the kind of weather you expect in August, but perfect for riding horses hard! I found out that Cindy eats as much as I do. Now she’s my friend for life! I am too excited to be doing a 50 mile endurance race. So many people came up to me and gave me hugs and said, “Welcome back.” There is nothing like the camaraderie of the endurance family. I felt like some celebrity. There was none. At the ride meeting, the fella did explain that his battery on the water pump failed and he was going to do his very best to get the troughs filled by the next day. Several people at the ride meeting were very upset because they wanted water NOW. Here’s what I say to them. Bring your own water so there isn’t a problem. YES, the ride packet did say there was plenty of water, but always anticipate there won’t be. Problem solved! Cindy and I had great conversations but eventually it got too darned damp and chilly to sit out anymore so we turned in. Although I don’t normally put blankets on my horses, because it was so damp and chilly, I threw sheets on Steel and Miss Daizy. They were all fed and snugged down in their corrals. I know Dom and Mike wouldn’t be in until the wee hours of the morning so I told myself to ignore the arrival of a car. My instructions to myself worked because I surely didn’t hear them when they got in! I slept pretty good considering how excited I was. I only woke up once, to get another blanket because it was chilly. RIDE DAY and I slept until 4:30 am .. I leapt out of the truck and quickly fed Miss Daizy and Steel. Imagine my surprise to not see everyone else in camp bustling about. I felt that I was running late late late bu sleeping in. The girls are hungry and seem full of energy. I see that Dom made it in last night as her little blue car is parked in front of my truck. Not knowing WHEN she got here, because I slept all night like a good girl, I moved around the camp quiet as a mouse so as not to wake her or Mike. I figured they have a long day ahead of them so they should be sleeping as much as possible. Cindy had been up at some point as I hear Bailey crunching on hay, but her camper is dark so she must have went back to bed. I am trying not to wake her either. I had everything laid out the night before, checked and rechecked, so really at this point I fold blankets back and brush Miss Daizy and Steel, then put their blankets back and sit down to read my Kindle a bit. At 5:30 am. I walk up to the hold area where they said they’d have a continental breakfast and coffee. I have to make a note here for the ride management. INSTANT COFFEE is not coffee. And it might have been tolerable if the water was stoking hot instead of lukewarm. That is my gripe for the day. Fortunately, one of the items in my camping gear is Maxwell House coffee bags. Yep, just like a tea bag, it is real coffee in a bag – just add hot water. No generic brand instant coffee nasty stuff for me! I take my coffee and banana back to the camp and Pass Cindy along the way. She’s chipper (whew) and we have a minor discussion about instant coffee and why endurance riders need BLACK BREW to get their morning started. Back at the camp, read another chapter and I hear Dom’s car door open. I get up and walk over and she’s bleery eyed, but bouncing and happy. Gotta love Dom. I give her a quick run down on the ride start time, trail ribbons, mileage per loop and she’s ready to go. We start tacking up the horses at 6:00 am when a person comes around the camps leting us know that due to the heavy fog, they are postponing the start time from 6:30 am to 6:45 am. We get in the saddle and start warming up the horses. Miss Daizy is totally unconcerned and is eating grass. I don’t think she understands what 50 miles means. Steel is more interested in staying next to Miss Daizy to do anything but she’s quiet and totally not a freakazoid like a couple horses we saw were! I love starting horses into CTR’s first because they see horses leaving in small groups all the time and they become accustomed to staying behind to wait for their turn. In endurance, they “TIME and GO” and it’s a mad dash of all the horses starting at once. It was our goal to wait 5 minutes from the start and let all the yahoo front runners get on trail before we left. 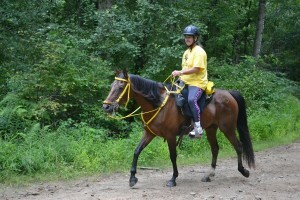 Wendy had joined us with her young gelding and she was all for letting the yahoo horses get out before we went. 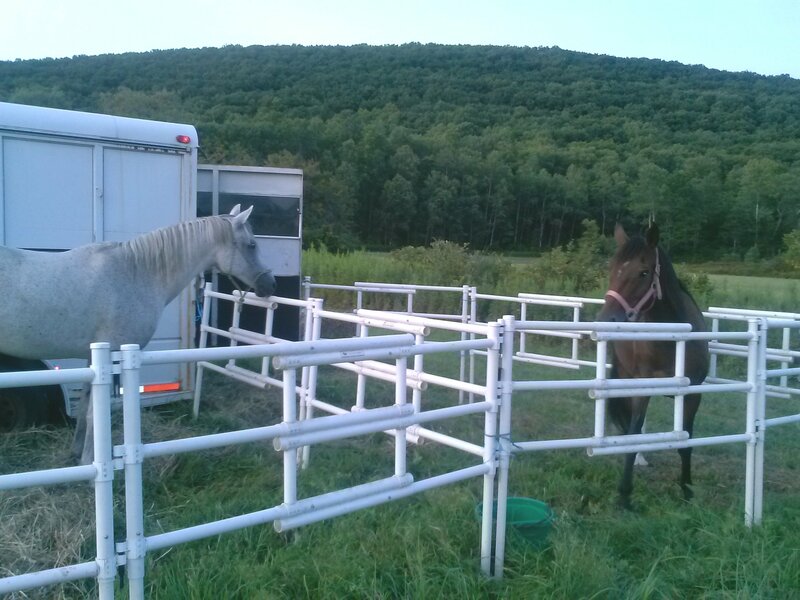 Her gelding was excited but standing around with Miss Daizy, Steel and Bailey where were all like “Ho-Hum” he quickly settled down for her. FIRST LOOP – Time 7:01 am – we’re out on trail. Three loops (all the same trail) Pink, then blue, then pink. On the first loop, they added in a five mile green loop at the end of the pink loop for us 50 mile riders so we’re doing twenty miles. I had already told Dom that Miss Daizy and Bailey may leave her in the dirt on the first loop .. and we surely did. Within the first three or four miles, it was Miss Daizy and Bailey boogying down the trail. The trail started to get tough at that point and I was having a grand ol’ time on my energizer bunny. She is a “downhill” horse. This means she will really put on the speed on a decline. Even a steep decline. She simply loves it. One a gentle decline, we have clocked her trotting at an amazing 16 mph. 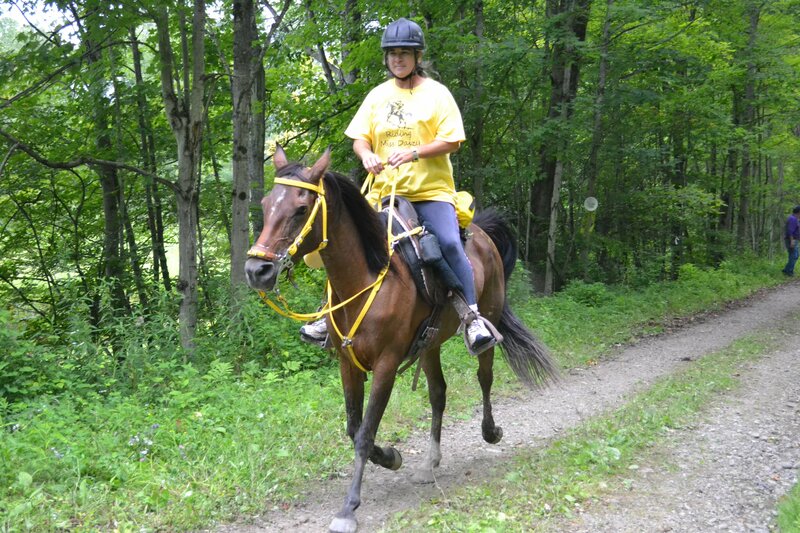 Most horses have to center, or even gallop to keep up with her on the declines. On the inclines, she’s a bit more lazy, and this was where Bailey took over. He is a powerful machine going up the hills. Miss Daizy was not going to let him win, so she stayed right on his tail. And yes, most of the loop was either up or down. In several places those ups and downs are very steep and very long. My GPS gave us one of the declines on the first loop over a mile. And it was wet muddy and consisted of loose rock. Second loop is a reverse of the first loop so I was riding on these steep declines making a mental note that we will have to be coming back up all the places we are now going down. On the first loop there are several places where we can make really good time as the incline and decline is slight and the trail is good footing. I loved those places as Miss Daizy got into her “go to sleep” canter and we just rolled along. By the time we had done ten miles, I realized that this is not the trail I should have chosen for a first 50 mile endurance ride. It was going to kick our butts! Mud. Lots and lots of natural springs on the trail (good for hydration, bad for footing). in some places, by the time we got onto the third loop, those muddy areas were knee deep. This is not an exaggeration! More on that for the third loop story. I’m still on the first loop story! When we came into the green/pink water stop the second time, we were told that a mistake was made and Sam had sent us out on the wrong trail so we were to finish the pink loop and do the green loop at the end of the ride. WHAT? Last loop is gonna be the long loop? So we headed back to base camp. About a mile from base camp there was a young lady there directing us onto the green loop. No no no, Sam told us we were not doing the green loop. At this time, Miss Daizy and Bailey had caught up with the front runners and there was a group of about 10 of us arguing that we had been told not to do the green loop on the first go around. As a group, we made the decision to skip the green loop and go to base camp. We get to base camp and Cindy is freaking out about the green loop. She is so afraid of a repeat of MTM ride. Faith (the ride manager) is nowhere to be found to question it. There are only two horses in camp at this time so we finally made the decision (as a group) to go back out on trail and do the green loop. I’ll bet. So are we. Do the green loop, don’t do the green loop. The green loop was bizarre! Most the trail was freshly cut through the woods and we had to pay close attention to the ribbons because only one or two horses had been through here at this point so the trail wasn’t beat up and easy to follow. A couple times I had to to yell that we missed the turn and we backtracked. It was way fun, my fun-o-meter was pegged at the top. (as you can see in this photo!) And the other rider here is Steven. 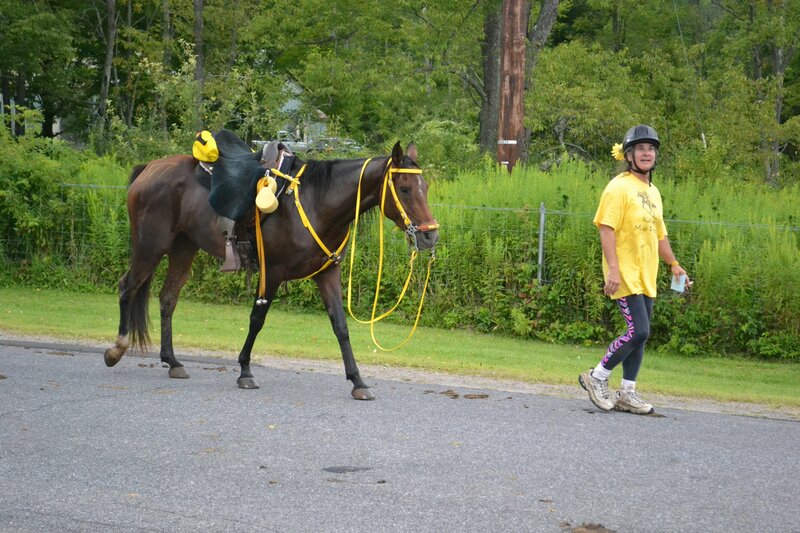 Steven’s horse lost a shoe and fortunately Cindy had an easy boot with her that fit his horse. We left him behind as he was fitting his horse. Lindsey was still with us and she’s just as silly as I am when riding. I was having a most delightful time and Cindy is on a serious fun-high and Lindsey is most silly! What fun this is! We did an extra two miles because we went into base camp then went back out onto trail on the first loop but it’s all good. We finished the green loop and came into base camp with only a few horses in front of us. On this tough tough trail, Miss Daizy and Bailey are running out front. That is not my goal today … my goal is to finish. However, it would be cool to finish top 10!!! At our hold setup, Mike was nowhere to be seen. I saw Dom’s little blue car parked close to us but I didn’t see anyone in it. That’s okay, I’m used to riding alone and doing my own work. I quickly dumped water for Miss Daizy’s slurry and let her start eating while I yanked her saddle off and threw some water on her back. She was breathing really easy so I figured she was probably already pulsed down. We walked back up to the vet check and I was right. Miss Daizy pulsed at 52. Bailey was at 48. Trot out and Miss Daizy is pulling me along. She looks and feels great. Visions of the Muckleratz ride run through my mind as he gimps down to the cones and back. Same left rear off. Cindy has this look of utter dejection on her face. She tells the vets she wants to go massage him for awhile and see if she can bring him back to soundness. Maybe he has a cramp. They hold her ride card. I get mine back and see that Miss Daizy has all A’s. Remarkable considering she vetted in the night before with a couple of A- and one B. She just did a tough 22 miles in 2 hours and 11 minutes and she improved. When we get back to our hold setup, Mike is there and he feels terrible that he missed us. NO WORRIES! I ask him if he could take my card up to the time and get my out time. Okay – hold time is 45 minutes. I can go back out on trail at 10:26 am. I mosey down to Steven’s tent to see if I can go back out with him since I think that Bailey is not going to be able to continue. I saw that Steven had vetted after me so I knew his out time would be after mine. Steven was not there and the older gentleman at his hold tent was very abrupt and unkind to me when I asked him if he could give Steven a message about whether I could ride back out with him after hold. I was really taken aback. I will not repeat what he said because it was totally inappropriate. I do not want people reading this story to get the wrong impression about endurance people. We are generally very helpful and kind … Well, I guess I won’t ride out with Steven. Since Mike was holding Miss Daizy while she chowed down on her food, I went to find Lindsey to see if I could catch up to her on trail and ride with her. She vetted in a couple minutes before me so she’d be going out a couple minutes before I did. I didn’t see her anywhere, nor her spotted riding companion, so finally I went back to my hold setup and decided I would wait for Dom and Steel to come in and ride out back out on second loop with them. Just means that Miss Daizy will get some extra resting time in the hold. Dom came in on Steel, and Wendy was right behind her. They both look very perky! Love Dom! She’s always so happy. Steel vetted through perfectly so when she is allowed back on trail, I’ll be going with her. SECOND LOOP – out on trail at 11:12 am – reverse of the first loop, without the green loop. 15 miles. Dom and I leave base camp to get on trail and we completely forgot about Wendy. We were having such a good time talking and giggling at the hold. I am such a bad person. Wendy did catch up to us in the first two miles. Off we go. Wow, those declines on the first loop are now the inclines on the second loop and many many times I had to ask Miss Daizy to engage her four-wheel drive unit. We were having some serious troubles in spots getting up the inclines because it was so steep and muddy. One place, we were all slipping backwards and I was fearful that I was going to flip over. I took in the trail and decided it would not be wise to get off and tail Miss Daizy up the hill because I was sure I would not be able to walk in the deep mud so she’s end up dragging me. On the good trail, we made up time. Miss Daizy is still the energizer bunny, even with all the mud and hill climbs. 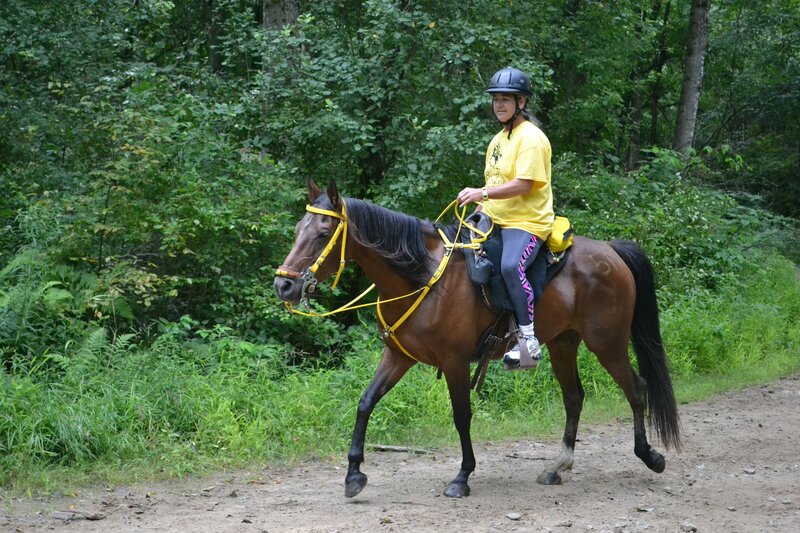 We cantered quite a bit on the second loop once we got onto good trail and good footing. The trail is starting to get beat up. 60 riders out on it first go around, and there is about ten 50 milers and five 30 milers ahead of us on second go around. I’m almost sccared to see what it’s gonna look like when we come back out on it the third time. Miss Daizy and Steel are drinking every chance they get and that pleases me more than anything. it has taken me a long time to convince Steel that she can eat and drink on trail while under saddle. Steel has not peed, though. That concerns me. Miss Daizy has already peed three times since the ride started. After hitting the main water stop the second time, we only have four miles to go back to base camp. OH YAY! I have to pee something fierce! We come in and Mike is waiting for us at the start line. I love this picture!!!! We have now done thirty-five miles and our fun meters are still pretty high. 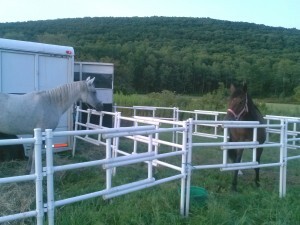 All three horses are still perky and have lots of energy. I am enjoying myself so much, I can’t even tell you how I feel. I am so excited to be riding 50 miles again, I have missed it terribly. My back feel great. My hip feels great and I am flying high on the energy level that Miss Daizy has even though she has NEVER conditioned on trail as tough as this and she’s moving right along. She is a rock star. I love this little mare to pieces. And Steel is showing her breeding as she moves along easy and on loose rein with Dom. I am VERY impressed by her as this is only her 4th competition *EVER* and she is doing really well. Dom says Steel isn’t forging. YAY … She is interfering in the back but those interference boots we have on her are doing the job. The bell boots on the front of Steel are starting to create rub marks. I get it! The mud is so deep, it has to be packing up in there when we’re traveling through it. Poor Steel. We didn’t do this second loop near as fast as the first loop but we’re still moving at a good clip. All three horses pulsed in rather quickly and we had good strong trot outs. Cindy was helping Mike at the hold so I had plenty of time to pee – TWICE – and rest a little bit before we saddle back up to do the last loop. THIRD LOOP: Fifteen more miles to go. Daizy leaves the hold at a walk this time. She’s not interested in trotting out and catching up to anyone. Okay, it’s the pink loop again, but no that long incline is a long decline. We are out on trail again at 2:12 pm. I’m ready! I feel great. I have eaten all my snacks and sandwiches and have drank all but two of my seven drinks. We didn’t forget Wendy this time. Out we go. Miss Daizy took right off down the trail. I look back and we’ve left Dom and Wendy in the dust. They catch up and we rock the first eight miles pretty easily. Now – we have those hard inclines and declines coming up for the last seven miles. The mud is so beat up by horses it’s almost impossible to imagine what it’s doing to our horse’s muscles churning through it. Miss Daizy is starting to slow down through the mud and the uphills have become walk-only. She’s still moving out on the flats and downhills, but up hill, it’s all she can do to keep moving. All day Miss Daizy had been jumping most the natural springs and clearing the muddy sections. I hate that she does this because she needs to save her front legs for working, not jumping. We had gotten into an agreement, her and I. If I let her jump the big ones, she would only jump them and trot through the little ones. Well, we came up on a little one, I thought she was going to trot right through it – per our agreement – but she decided to do a HUGE leap. I was totally caught off guard and Dom said I caught about a foot of air between me and my saddle. I was getting tired and all my weight was in the right stirrup so when Miss Daizy leapt, the saddle tried to disengage. Miss Daizy landed, felt me and the saddle off to the right and she quickly stepped right up underneath me, never missing a beat, and I was able to shift the saddle back into position and stay on. Shortly after that, we came to a very side and very deep muddy spot. Miss Daizy, being the smart Arabian she is, decided it would be safer to travel on the side of the trail rather than go through the deep knee sucking mud. She stepped right into quick mud and her front legs sunk down to her chest. Just about the time I was eyeballing the trail to get off her so she could extract herself, she made the dicision to jump straight up in the air like a mule and twist sideways. That quickly she did her own extraction and then started moving down the trail like it never happened. I looked down and saw that my feet had gone down into the quick mud and I now had shoes filled with goop. Go Miss Daizy! Unfortunately, we had been moseying along eating for a while and when I put her out front again she found some back up gas in her tank and she left Dom and Wendy behind. We traveled about a mile when Wendy caught up to us. She said that Dom was having trouble with Steel and we were to keep going. We trotted about another mile and then I got worried. 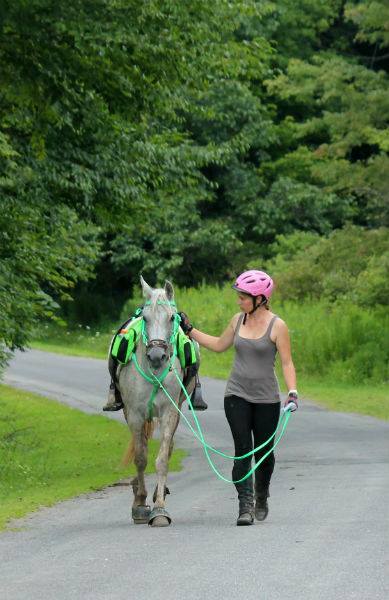 I was remembering Muckleratz when Steel decided she couldn’t do downhills anymore (because her girth was hurting her) and I didn’t want Dom left out on trail all alone. We slowed back to a walk and began some more grazing while I waited. About the time I was going to go back, I saw a little set of grey ears popping through the trees. Dom said she really had to “encourage” Steel to get moving again but once she caught sight of us, she was all ready to move out again. We had hit about 3 miles left and it’s mostly downhill or level. Miss Daizy is tired (yep, first time I ever rode this mare to a point of tired) but she was still perky and it didn’t take much to get her to trot some on the level parts. Once we hit the one mile to go, it’s all pretty nice trail and Miss Daizy perked up and started trotting. Dom and Wendy were right on our rear. FINALLY! We finished. 50 miles of rugged terrain with over 9000 feet of elevation changes. At this point, I thought I would be dead but I still feel really good. No pain anywhere except my knee and that’s pretty minor. I am a little tired but not overly so. Miss Daizy has definitely lost some of her bounce, but she’s still following along behind me! Dom and Wendy perked up once we crossed the finish line. THANKS FOR BEING MY FRIENDs, Dom and Mike! The two girls completed their first 50 mile ride! Miss Daizy earned me 125 points in my division with a 12th place finish. We did it with an “in the saddle time” of 8:04 hours and an overall “start to finish time” of 10 hours. Wow. Steel earned Dom 111 points in her division with a tie with me for 12th place finish. 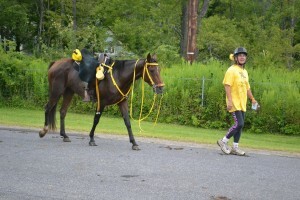 She had an 8:49 hours “in the saddle time” and an overall “start to finish” time of 10 hours. Wow. 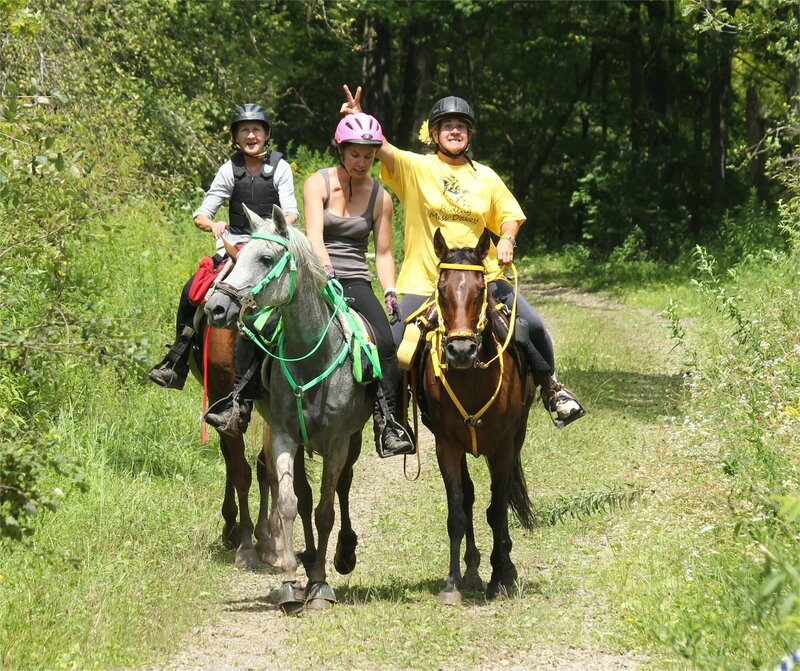 I am thrilled that if I had not waited for Steel at the first hold, and I had gone back out with Lindsey or someone else, we could have finished in the top 10 … for her first 50 mile endurance ride. I SO WANT TO DO ANOTHER ONE RIGHT NOW!!!!! I am jazzed by my little bitty horsie. She is a Rock Star. We had a wonderful visit after the dinner and awards at the Cindy/Dodie Camp Site. We rapidly started to poop out and by the time it got dark, we were all ready for bed. This is when my fun begins. All night I had leg cramps. I mean they were bad charlie horse cramps. First one leg would wake me up. I’d massage it and fall back asleep then the other leg would wake me up. I’d massage it and go back to sleep then they decided to work as a team and they’d both cramp up. Then it started to rain. at first it was a light rain and while I was massaging my leg, I quickly thought about the girls standing in the rain with blankets on. Miss Daizy’s blanket is waterproof but Steel’s is not. It was just a pitter patter so I didn’t worry about it and I went to sleep. Shortly thereafter, the sky opened up and it woke me up because it was beating so hard on the roof of the truck. Nope, not getting up to take blankets off now. They’ll just have to wait until it stops. It stops and I get out and check on them. My left leg (the bad one) doesn’t want to support me as I gimp over to take Steel’s blanket off. She is shivering so I quick grab the cooler to put on her and tell her under no circumstances is she to lay down while wearing the cooler because it will wrap around her legs and she’ll break something (like her ankle). She nods to me and quietly snuffles a quick thank you in my ear. I drag my gimpy leg back to the truck and go back to sleep. The little walking I did must have solved the cramping situation because the legs left me alone for a full hour and a half of sleeping. My brain tells my body to get up at 5:30 am. Because I always get up at 5:30 am. I could not go back to sleep, I was wide awake. I got up and fed my guys, being as quiet as I possible could with two girls hollering at me to hurry up because they are starved. I gave each of them a full bale of hay yesterday after we finished the ride and every bit of it was gone. And they had eaten the lush grass in their pens right down to the dirt. I love that they eat well. It’s starting to get a little light out so I decided I’ll start taking the pens down and packing them away. I’m still being uber-quiet so as not to wake Cindy or Dom or Mike. Miss Daizy is NOT helping me as she studies what I’m doing and gives me her two cents worth every three minutes. Cindy gets up and says “HI! Good Morning.” She very quickly broke down her camp and was rady to roll on out of there in about 30 minutes. BYE! We talked a bit the night before about Bailey and his couple of issues (like keeping meat on his bones, his top line and his owie.) Cindy had the vet pull blood and do some testing the day before. Everything came back pretty normal. I suspect he pulled a muscle at the Muckleratz ride and it simply wasn’t fully healed. That trail was tough for any horse. I got everything packed and loaded up my two wonderful girls. I cleaned up their poops and started the truck. Then I went over and woke up Dom and Mike to say Good Bye. Hugs all around and I hit the road. A couple hours later, on the road, they passed me. We waved and smiled and I drove home without any incidents or adventures. NOW FOR THE NEXT RIDE … Chesapeake three-day 80 mile CTR. When we complete that, Miss Daizy will have earned her Versatility for ECTRA. Then we do one more 50 mile ride before the season ends, at Mustang Memorial. I might (and that’s a big might) go to Fort Valley for a 50 mile ride, too. Fort Valley is some tough trail, I’ve done that ride seven times. It is all going to depend on whether I can find someone to substitute for me to teach the kids chess classes on that Saturday.